"Our experience is not like most families. We were visiting my husband’s family in Fort Madison, Iowa from Minnesota when my water ruptured right at 24 weeks. My husband rushed me to the Burlington hospital where they stabilized me and then transferred me by ambulance to University of Iowa Hospitals & Clinics in Iowa City. We got to Iowa City very early in the morning on March 4, 2018. Not knowing what to expect or what was about to happen, the doctors and nurses calmed us down and let us know that our little girl was doing OK and that I would be staying at the hospital until she is ready to be born. They were going to try to keep me pregnant for nine weeks to help her continue to grow. Our world just collapsed on us and we couldn't even form thoughts on what just happened and what our new journey into parenthood was going to be. We only packed for a quick weekend trip and had almost nothing with us that we needed. We called my family up in Minnesota to let them know what had happened and that we would not be coming home anytime soon. Luckily for my husband and I, we both graduated from the University of Iowa, so Iowa City is already a second home to us and we felt comfortable being in a familiar place. It was the best worst-case scenario for us. I was in the Mother-Baby Unit for 10 days before I started to go into labor. I was monitored for a few hours before they brought me back to labor and delivery. They put me in the same room that I was in the night my water broke. After a few hours and a quick progression of my labor it was time to push and our little girl McKinley Belle was born. She came into this world with her big eyes wide open looking around the room like, “What just happened?” The NICU team was there and waiting for her and quickly whisked her away and started working on her to get her stable. They wheeled her over to us before taking her back so we could quickly see her. We knew she was in the best hands possible and off they went. After a little bit Glenda Rabe, MD, came to talk to us and let us know she was doing OK and what room she was in at UI Stead Family Children’s Hospital so we could go and see her. We finally got to see our little girl in her room hooked up to machines, but she was alive and doing OK and that was all that mattered to us. We went and got some much-needed rest and would be back by 8 a.m. for the first day of rounds. We met with her team that morning and that's when we learned she was very sick. She was born with Group B strep meningitis and they started a treatment plan to get her healthy and fight off the infection. She did beat the meningitis but the infection caused her to have a grade 3 and 4 brain bleed. We won't know the impacts of her brain bleeds until later on in life but the doctors and nurses took the time and explained everything to us and our family. Amy Stanford, MD, sat down with my whole family and went over McKinley's health and possible complications for her future, she answered every question and helped us understand all the medical terminology and just really made us all feel at ease. We knew we were right where we were supposed to be and that UI Stead Family Children’s Hospital was the best place for us. McKinley also got pneumonia right after she beat her meningitis and she had her patent ductus arteriosus (PDA) – a fetal artery allowing blood to flow away from the lungs before birth – closed while we were at the NICU. When we were there we always got asked whether we planned to transfer McKinley to Minnesota and our answer was always no. We loved being in Iowa and we had the greatest care team for her you could dream of. 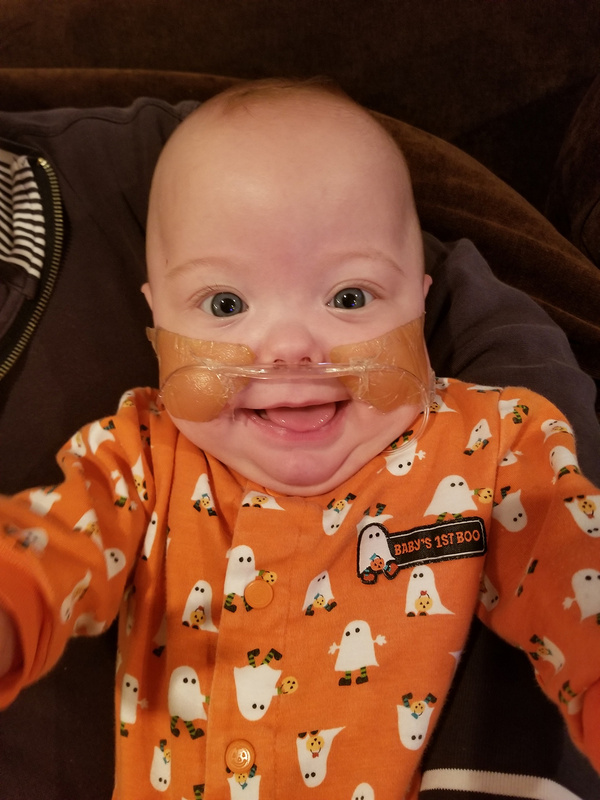 We spent 114 days in the NICU with her and as odd as this sounds had a really great experience. We made a family out of all the staff and we spent every single day at the hospital with her. My husband was able to work remotely and after my maternity leave was up my co-workers donated their PTO to me so I could stay down in Iowa. I made charms for everyone for their badges because there is this thing in the NICU where you are always looking to "knock on wood." There is not much wood around so we were always running around looking for some to knock on. The charms are wood beads, so they always have wood to knock on, purple beads for premature awareness, and a heart charm because everyone had the biggest hearts. When someone is taking care of your child when you can't, you have so much gratitude and love for these people that you just want to show them some appreciation. Our last week in the NICU was spent on Level 6 and us having to say goodbye to a family that we had grown so close to and loved. Most of those days were spent with tears and “we will see you soon.” We knew that day would come but we didn't realize how hard it was going to be to say goodbye to everyone. It was the most bittersweet moment. We were so happy our little girl was healthy and ready to go home but we were so sad to leave everyone. We decided to keep all her care and follow-up appointments down in Iowa with those who know her best. We drive down every couple months and meet with all her care team and see everyone who took such great care of us. We know some may view it as inconvenient but we know that they love our daughter just as much as we do and they are going to take the best care of her. They also are some of the top doctors and nurses in the nation and I know that they will do everything they can for her. We had our ups and we had our downs but we were truly in the best place possible. Being at UI Stead Family Children's Hospital can be extremely scary and stressful but the care team for your child is doing everything they can to help your child and will also try and make you feel as comfortable and at ease as you possibly can. Get to know your child's care team and really form close relationships with them. Ask questions and ask to get things explained to you. We joke that we have an honorary medical degree because of all the questions we asked and things we had explained to us. They all have your child's best interest at heart and will do everything they can to keep them healthy and protect them. We tried to stay positive and make the most out of every situation, it’s easy to get sad and feel down but you can't. Ask for help if you need it and there are so many resources available everywhere you turn. Also, get to know the other families on this journey with you. We met so many incredible families that are now life-long friends. They know what you are going through and you know what they are going through and those are the best kind of people to have around."